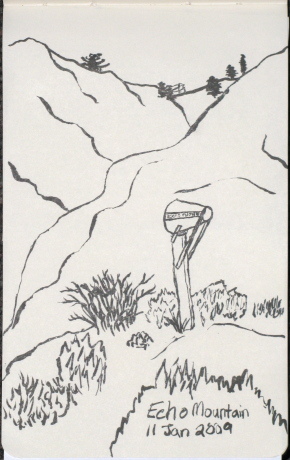 Just one bit of hiking with sketches for the month, but they weren't presented in the post for that hike so I'll put them here. Echo phone on Echo Mountain. 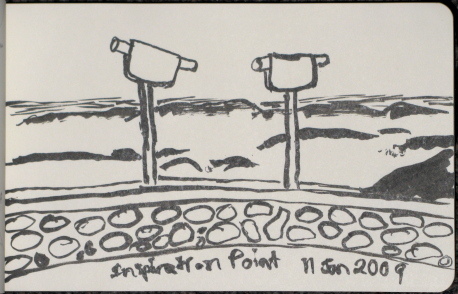 Sighting tubes at Inspiration Point, drawn in the dark without a lamp. Echo Mountain is the most popular local trek. Easy to find at the top of Lake, the other main street after Colorado in Pasadena. Even on weekdays, it can be a little bit crowded so on this gorgeous and warm, but not too warm, winter Sunday saw a veritable highway of people going up and down. The trail heads up 2.7 miles to the mountain and then three trails split off from there to go further up. I took the third one that you come to in the space of 50 yards just before getting to the location of the ruins of the old hotel and trains. The trail itself is mostly out in the open on a southerly slope with some amount of westerly slope visits. It can be quite hot in the summer, especially in the afternoon. Of course, on a clear day this affords rather grand views of the city. On a very clear day, there's even ocean out there to be seen. This was a very very clear day. A clear day in Los Angeles. The shinny thing is the Pacific Ocean, of course. Past the point on the left is Catalina Island, a scant 75 miles away. Altadena and Pasadena in the foreground. A little Eagle Rock and the Hollywood hills further on. Downtown LA in the center sticking out of the flat sprawl all around it as usual. A little of Glendale can be picked out. 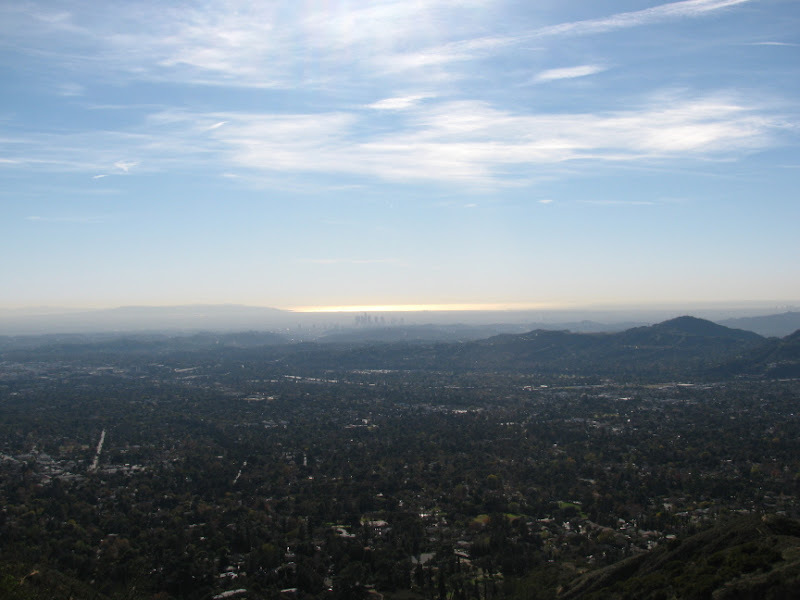 All sorts of other cities, some of which are really just LA by another name, can also be seen. 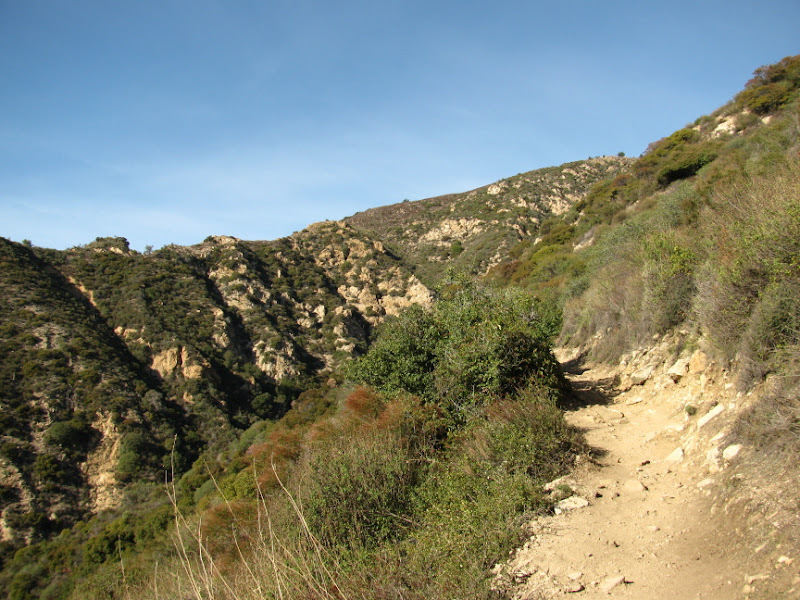 The trail climbs steadily up the edge of Los Flores Canyon wrapping around to Rubio Canyon, the peak being between these two. It's well maintained and, like I said, well traveled. The wide, fairly smooth trail bed has no tough spots to get through except if it's too hot to be hiking in which case the lack of shade can be quite tough. Los Flores Canyon on the way up to Echo Mountain from Lake Ave. The surrounding country is a bit green although water hasn't been plentiful yet.